TYRONE MANAGER MICKEY Harte has made one change to his starting 15 to face Cork in their All-Ireland SFC qualifier at O’Moore Park tomorrow evening (throw-in 5pm). The Red Hand sealed their progression to the Round Four clash after an 0-18 to 1-12 win over Cavan last Saturday. There were two late changes made to the starting team that day — Michael O’Neill started between the posts instead of Niall Morgan, while Killyclogher’s Tiernan McCann came into the backs with Cathal McCarron the player to make way. Harte has this week opted to hand Morgan the number one jersey, while McCann — who chipped in with two points from play at Brewster Park — keeps his place. Mark Bradley returns to the bench, after missing Tyrone’s 2018 All-Ireland qualifier run to date through injury. Cork meanwhile, have made five changes to their Munster final team as they prepare for the Tyrone challenge. It comes as a repeat of the 2009 All-Ireland semi-final, in which the Rebels triumphed. This time around, there’s a place in the Super 8s on the line. Email “Niall Morgan between the posts as Mickey Harte names Tyrone team for Cork clash”. 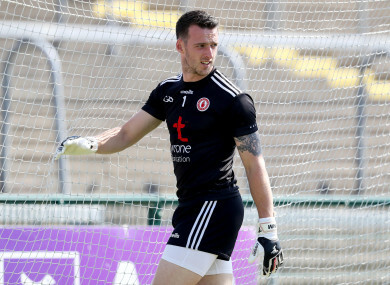 Feedback on “Niall Morgan between the posts as Mickey Harte names Tyrone team for Cork clash”.